Each year, I mark my calendar in anticipation of Apple’s annual WWDC event. I enjoy looking at this event through the lens of an educator. WWDC tends to provide the public with an opportunity to see where Apple is heading in terms of software. This year, Apple showcased iOS 8, and along with many UI enhancements and new and updated apps, there were several under-the-hood features that weren’t mentioned. One of these features is Peer-to-Peer Airplay, and it’s about to make mirroring of iOS devices in the classroom very easy. 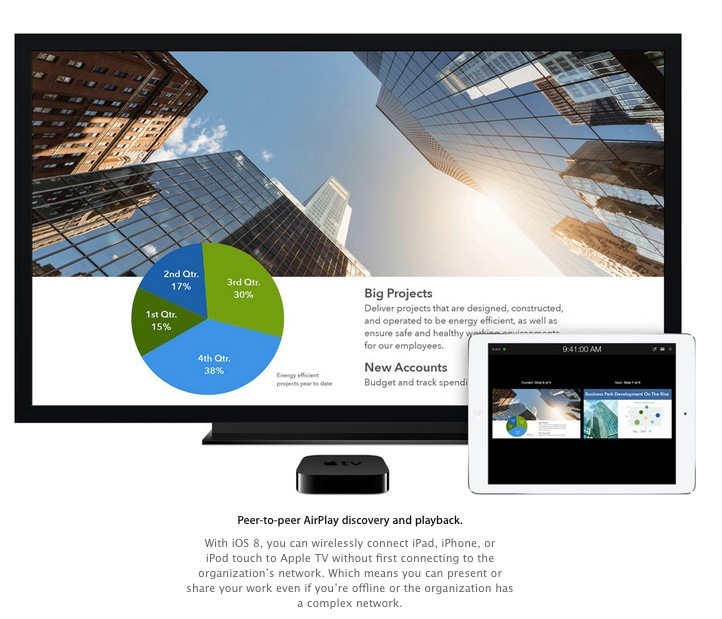 Peer-to-Peer Airplay in iOS 8 doesn’t require a network connection! Of course, a classroom will need an Apple TV hooked up to a projector, but with newer projectors supporting HDMI, an Apple TV can be plugged directly into the projector avoiding extra adaptors and cables. This will dramatically drive down the cost of equipping classrooms with this technology, and it removes several roadblocks standing in the way of making this a viable learning tool. It even removes the need for a classroom computer hooked up to a Smart Board. A teacher can move about the classroom with an iPad, while content is being projected on a screen. Although this feature wasn’t part of the keynote address at WWDC, there is little doubt in my mind that it will be a feature welcomed in many classrooms.